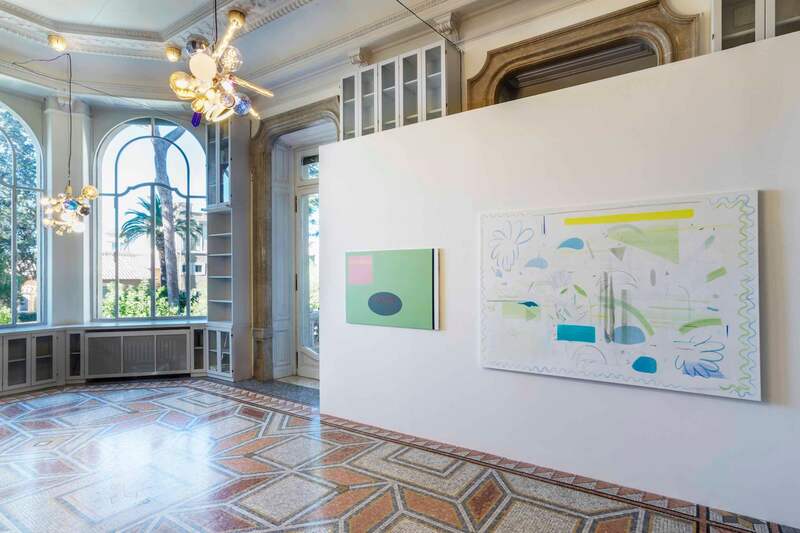 The Istituto Svizzero is pleased to present “From Berlin with Love”, a group exhibition by artists: Tina Braegger, Emilie Ding, Edgarss Gluhovs, Swetlana Heger, Charlotte Herzig, Andreas Hochuli, David Hominal, Samuel Jeffery, Flora Klein, and Kaspar Müller. “From Berlin with Love” brings together diverse positions on art by ten Swiss artists living in Berlin. Thousands of artists from all over the world are based in the German capital, and among them their Swiss neighbours. Sometimes they meet by chance, in a bus or in a bar, unaware of the fact that they are living, working, and sharing similar experiences in the same city. These situations contribute to many art scenes, creating groups and nurturing different environments that all belong to the creatively heavy and inspiringly strange, experimental vibe that is Berlin. Berlin is a city that is constantly questioning its identity and attempting to define its own way. Over the years, it has maintained one of the most prolific art scenes for post conceptual art as well as a taste for expressionist painting. Mediums that are no longer bounded by traditional categories, but rather free, just like the city of Berlin. Hosting the exhibition is Rome, renown as the eternal city and also a hive of residencies and artists from all over the world. As a city somehow owned by its temporal character, dominated by its history, Rome is able to offer a grounding experience for its creative visitors. The exhibition’s intent is to stimulate links between artists who are perhaps still strangers in Berlin, inviting them instead to imagine themselves being together, for a bit of time, in Rome. With these contrasts and comparisons in mind, we present ten different takes on time-based and ephemeral works. Tina Braegger (b. 1985) lives and works in Zurich and Berlin. Braegger is a performer, painter, and writer and graduated from ECAL (Lausanne) in 2015. She has exhibited in numerous shows and published her first novel The Grateful Death (2016) with Beckbooks in Geneva. Emilie Ding (b. 1981) lives and works in Berlin. Her work evokes abstract motives and issues related to their decorative uses and has been shown in numerous institutions such as: Palais de Tokyo (Paris), Mamco (Geneva) and Migros musuem (Zurich). Edgars Gluhovs (b.1980) lives and works in Berlin. His works are continuous explorations of delicate formal movements of possible iconographic codes. The artist was part of the Istituto Svizzero’s residency programme in 2016-2017. Swetlana Heger (b. 1968) lives and works in Zurich and Berlin. Her work brings into play structures of contemporary art, from its circulation to the commercial spaces in which its shown. Swetlana Heger has exhibited in numerous international shows. Recently the artist has been nominated new Director of the Art and Media department at the Zurich University of the Arts. Charlotte Herzig (b. 1983) lives and works in Switzerland and in Berlin. Her practice is essentially pictorial and is often used in large coloured installations. In 2016 Charlotte Herzig was recipient of the Nestlé Prize for Art. Andreas Hochuli (b. 1982) lives and works in Geneva and Berlin. His paintings are made up of many conceptual condensations that represent a murky and sensitive social indetermination. He has participated in various exhibitions, such as the Swiss Institute of New York, where he was invited by Valentin Carron. David Hominal (b. 1976) lives and works in Berlin. David Hominal’s works are characterised by a unique sensibility and by his total commitment as an artist. In 2016 he had two important solo exhibitions: Consortium in Dijon and at the Jenish Museum in Vevey. Samuel Jeffery (b. 1987) lives and works in Berlin. Samuel Jeffery’s objects reveal our idea of occupying space and the architecture of our relationships. The young artist exhibits regularly in Switzerland, Paris, and London. Flora Klein (b. 1987) lives and works in Berlin. Her abstract paintings depict a movement, an energy that goes beyond their simple structures. They are lines of force that expand in exhibition spaces. Kaspar Müller (b. 1983) lives and works in Switzerland and Berlin. Each of Kaspar Mueller’s actions allow us to seize beauty in reality’s small defects. In 2013 he had an important solo show at Kunsthalle Bern titled “I Shrunk the Kids”.